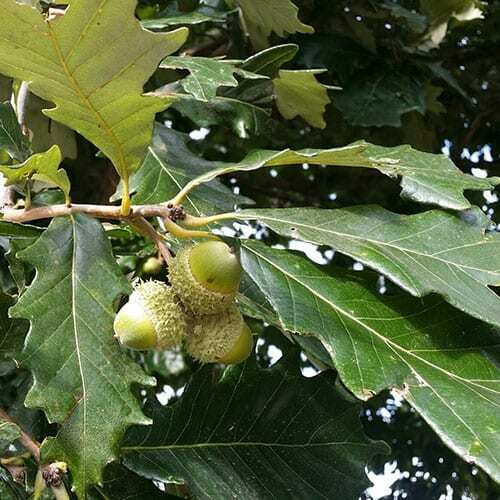 Swamp white oak is a medium sized, deciduous tree with a broad, rounded crown and a short trunk which typically grows at a moderate rate to a height of 50-60′ (sometimes larger). Leaves are dark, shiny green above and silvery white beneath, with 5-10 rounded lobes or blunt teeth along the margins. Fall color is yellow, but sometimes reddish purple. Insignificant flowers in separate male and female catkins in spring. Fruits are acorns which mature in early fall. Indigenous to north, central and eastern Missouri in moist to swampy locations in bottomlands and lowlands, such as along streams and lakes, valleys, floodplains and at the edge of swamps. Also has surprisingly good drought resistance.